Designs by Lisa Somerville: ODBD July Blog Hop! Welcome to the Our Daily Bread Designs July Release Blog Hop! If you arrived here from The Connie's Blog, you are in the right place! If not, you might want to start at the Our Daily Bread Designs Blog and hop from there so you have a chance to win one of the FOUR fabulous prizes! The Hop will run from 8am EDT July 1 until 8pm EDT July 2. The winners will be announced on the ODBD Blog on July 3. For all the hop details, be sure to check out the ODBD blog . 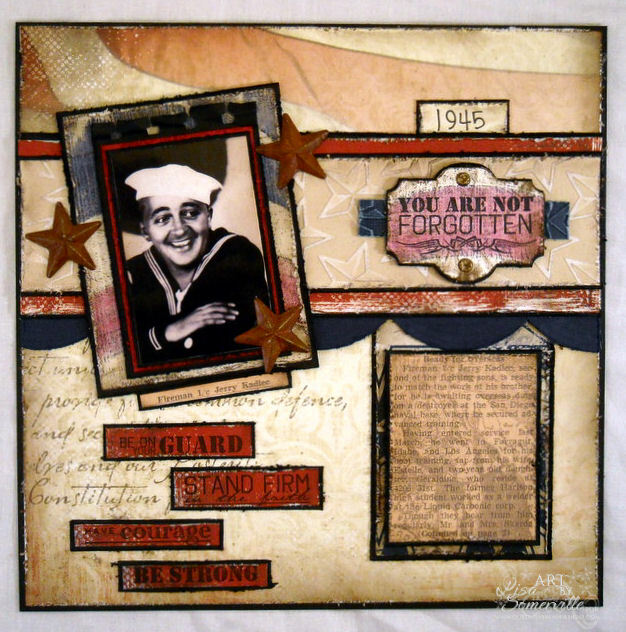 I created an 8" x 8" scrapbook page of my grandfather using images from Not Forgotten and the Old Flag Background. I stamped the Old Flag Background on Vanilla card stock and colored using Staedtler Pencils and Gamsol, distressing the card stock with Old Paper and Walnut Stain Distress. The sentiment is stamped on a leftover panel of the flag and cut with Spellbinders Labels Twenty-One. I embossed the panel under the photo using Core'dinations paper, then lightly sanded and added distress inks for an aged look. 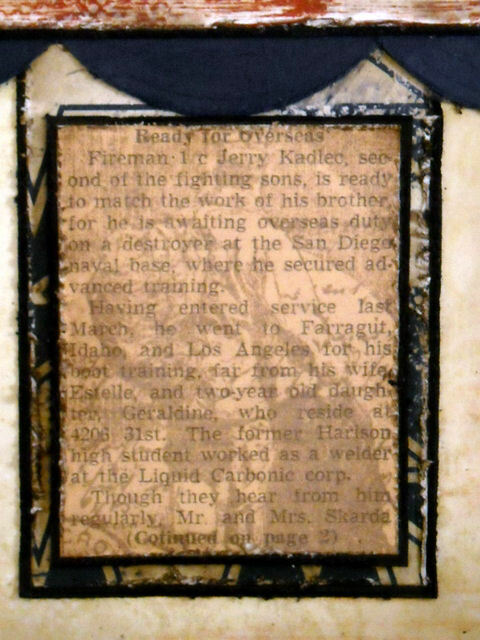 I happen to have the newspaper from 1945 that has an article about my grandfather and Uncle, so made a partial copy of that page, and stamped the solider image in Pumice Stone over the text, again distressing and inking the edges. Love that picture of your grandfather! His smile lights up the picture and I can see a family resemblance. Lovely layout! Thank you for doing a page. Love the cards, but pages are also an inspiration. Lovely work. Ohhhhhhhhh, Ahhhhhhhhh, amazing pages in time, how fitting for this weekend too! Grandpa is looking down and so proud of you! I love your layout. Your grandfather had a beautiful smile. Looks like he enjoyed life. OMGoodness... how special is this!! it brought tears to my eyes! what a fabulous page, Lisa!! I love this, Lisa! What a special tribute to your grandfather, and I love that the stamps for this month were so fitting! The soldier image over the newspaper clipping is super cool. OMGoodness Lisa! This is incredible! What an amazing tribute to your grandfather! What a lovely page layout and such a tribute and reminder to us all who are serving in the military. Lisa, GASP!! Awesome page!! I am speachless (and you know that sure dont happen much...LOL!) So fun to have you on ODBD! Very creative - great job! Great layout you should be very proud. Love the use of stamps on a SB page! Fabulous keepsake and tribute to your grandfather...love how you used the flag for the background of the picture and how neat that you had an article to copy and use!! God bless. Hello Lisa, beautiful card using the pic of your grandfather. Love it! Happy 4th July USA. Love the scrapbook page, it's just wonderful. Thank you for sharing it. What a beautifully created layout Lisa!! I just love how you cut apart one of the verses for your layout!! What a priceless memory of your grandfather!! Have a great holiday weekend!! Hey girlfriend! Great projects. Your family should be so proud. You did a great job. how wonderful a tribute for your family. it's amazing how something as small as a pic and a newspaper article can be transformed into a memory that will last forever. beautiful job. Lisa this is one amazing layout! LOVE the pic of your grandfather and how you copied the article and overstamped with the image! A wonderful tribute to him and a great use for this set! So glad to have you hop with us this month! Great page layout! Thanks for sharing it with us. Love your card and layout! Great way to personalize with a family photo. Thanks. What a great scrapbook page for your grandfather! Love how you used the new set! Wonderful tribute! Lisa this page is stunning and a grand tribute to your grandfather's service! I always feel if you are going to use a phote image, have it be someone in your life! Such a wonderful and amazing tribute to your Grandfather and he would be so proud! Love every little detail! Have a wonderful 4th! Love, love, love how you used this set for your 8x8 page! Just perfection! Love everything about it! So glad you could join in on the hop and have you joining the ODBD scrapbook team! Yeah!!!!!!! Have a blessed weekend! This is a beautiful tribute, Lisa! Your scrapbook page is awesome and how terrific is that , that you have the newspaper about your grandfather and uncle! It really added so much to your beautiful page! Thank you for sharing. Your card is absolutely perfect for my grandfather! He was a sailor in 1945 and still talks about his war service (he received a purple heart for combat injuries). I'm going to use your design to make a similar card for him. Thank you so much. Great job and wonderful tribute to your grandfather and uncle. What a wonderful page, Lisa. It is so nice to capture your family history like this. I aspire to your style of scrapping. What a fun and inspiring page! It is so neat that you had the newspaper clipping to add to it. What a great tribute. Thank you for sharing that with us! Gorgeous! You grandfathers smile is infectious too! Perfect stamps for this scrapbook page! Oh my...this is just a beautiful layout! This is a wonderful way to use these stamps in a personal way. Great job. Great page layout! Fantastic use of the set too! What a wonderful page. You did a fantastic job. Nice! 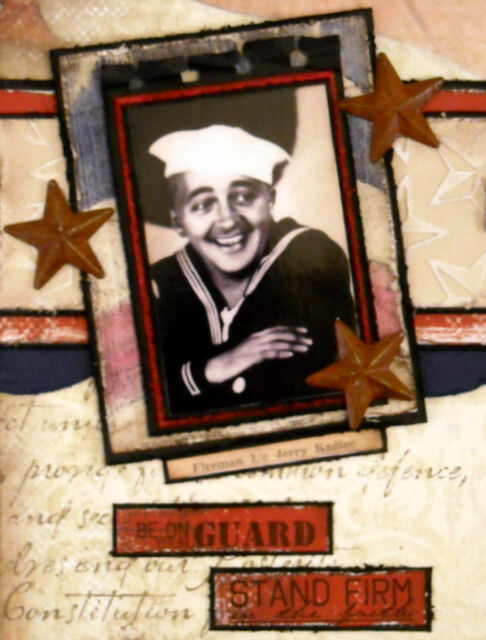 Great use of the stamps and images on a scrapbook page and what a sweet tribute to your grandfather. Nice work! This is such a lovely page. You did a wonderful job. Awesome page! Love your newspaper background for the soldier image! What a beautiful tribute to your grandfather and a great use of the ODBD stamps! TFS! Awesome card, Lisa! Neat photo, and cool way to use it! Happy 4th! Such a great page!! Thanks for sharing!! What a wonderful page and loving tribute to you grandfather. How special to have the newspaper article too. A lot of love went into this!! Gorgeous page Lisa, wonderful tribute to your grandfather, and such a good idea. What a great tribute to your grandfather Lisa! Love the vintage look of this page! Good looking guy too! I see some of him in you! That is a compliment girl! Have a safe and happy holiday weekend! Lisa, this is a stunning card and must hold a tremendous amount of meaning to you. Thank you for sharing and creating it. Oh, my goodness! What a wonderful way to use these new stamps as a family keepsake honoring your grandfather! Each element is a perfect part of the whole presentation and so very creative. Lisa, what a beautiful page you've created to honor your grandfather! Love how you used the ODBD images to enhance the theme of this page! Great job!!! I love what you did with this layout! So inspiring. So Cheerful! Great scrapbook page!! Thanks for sharing! This is a great LO. I love how you used the stamps on the wonderful page. terrific layout! Your grandfather would be so happy how you honored him! I am just in love with these stamps and the layout you created! Thank you for your inspiration! Wow what a great layout and a very creative way to use the different elements. You grandfather would loved the way you honored him. TFS Eunice B.
I love your page. The layout is fab. Your grandfather looks like a very jolly fellow. I love the personal touch you have put on this card. such a lovely keepsake. super way you have put it all together. What a super wonderful tribute to your gradfather. Your work is so well done! what a beautiful tribute to your grandfather-it's obvious you put your heart and soul in this piece.It looks like it was really made years ago-love it! Wow What an awesome job on your layout!! I love the idea of stamping the light emage on the article about your grandfather and Uncle!! What a lovely tribute to your Grandfather. Love your page. Lisa, what a great tribute to your grandfather. This is a stunning page and so much detail!! What a wonderful card as a rememberance to your grandfather. Lisa, what a great idea! I think I may borrow part of it. My father was in the Navy. My family would love a card similar to your layout. Thanks! What a wonderful page, Lisa! Your pics are terrific and perfect for your page. What an amazing layout. Love how you stamped the image over the journaling. What a beautiful page. Love it. Nice page! I really like the colors complement the picture of your grandfather. that is so cool how you stamped over the words!! very cool layout!! such a great vintage touch to the layout ! wonderful tribute indeed! What a truly special card for the upcoming July 4th celebration. Great job!! Great project & use of this stamp set, wonderful picture of your grandfather! Thanks for sharing!! I love your layout... love, love, love it! And I'm not a scrapbooker! But you definely inspire me to try it again! Love your scrapbook page!! Gives me an idea to do one for my Grandfather.So patriotic!! SUCH beautiful use of stamps, wonderful layout! VERY TOUCHING!!!! What a great layout. I just got a picture of a great-great uncle in his Civil War uniform. I'll have to do a page similar to yours. This brought back some special memories to me of my dad and uncle who also served in the navy. What a nice way to honor a special man! What a wonderful tribute! Love the total look of it. Great layout, what a lovely tribute. Lisa, your page is fantastic!!! Phenomenal job, love the picture of your grandfather and the partial article is the perfect touch! What a honor you did for your Grandpa with this fantastic 8x8 page. It is so patriotic and just so touching. Ty. Lisa, honoring our ancestors is such a show of love for our heritage, your card and your scrapbook page are a perfect testimony of that love. What a great tribute to your family! Love the layout. Such a nice tribute to your grandfather. Nice design. Wht a beautiful way to preserve someone's memories. My father was in the navy too! Thank you, Lisa, for sharing your grandfather with us. I love how you highlighted his image on the page. What a great smile! Great layout, a wonderful tribute to your grandfather. Fantastic layout and use of the stamps! I just love your page layout. What a great tribute.